Anyway, if you also want to add some fun onto your blog, here's a tutorial on how you can simply add those cute smileys on your blog posts. 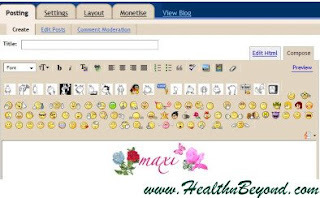 By the way, you can only install these emoticons when you are using Firefox. This will not work (as of the moment) with Internet Explorer. 1.) Open your Firefox browser then visit the Greasemonkey add-ons. 2.) Click the Add to Firefox button. 3.) Another window will open. Click the Install Now button. 4.) Restart your Firefox browser. ***To know if you have successfully installed the Greasemonkey add-ons, check for this icon at the right hand corner (bottom most) part of your screen. If the icon's there after restarting your browser, you are then ready to proceed to step number 5. 6.) Login to your blogger account. Go to the Layout section then Edit HTML. 8.) DON'T click Save Template at once. Click the Preview button first. If everything seems to be okey (meaning, no "Your template could not be parsed...." message appears upon preview), then you can now save your template. To check if everything's working, proceed to the Create (Dashboard --> New Post) section and see if the Smileys are on the control panel. Your Create Post section should look like this: That's it! Have fun with your Smileys ! I done this already but it was so funny because supposed to be in my first blog will appear the icon but I find out when I log in in my second blog there I found out that it works there the icon not the one I supposed to put the icon :-D.. ANyway thanks sa info. hehe. lagay mo narin sa isa mo pang blog. hehe. next time bru, will surely ask you for help! Hmmm. weird. The smilies aren't working? Did you place the given code just above the ]]> ? If not, it will not really work. I am sorry I am new to blogging and I was unable to get this to work. (I do have greasemonkey installed and on the bottom corner of my screen) Is there possibly a different way to do this now since we have new templates and the Template Designer? Thank you so very much! Have a happy and safe 4th!